Torquay United player-manager Kevin Nicholson says there was "no excuse" for their 1-0 FA Trophy quarter-final defeat at Bognor Regis Town. Snorre Nilsen got the only goal for the side who play in the Isthmian Premier Division, two levels below the Gulls. 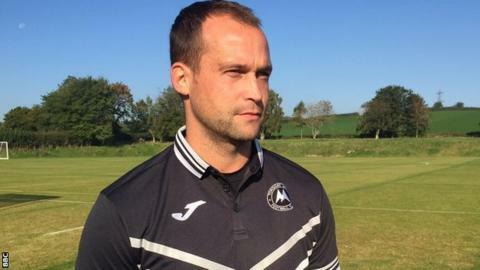 "We didn't work hard enough - whether that was fear or complacency, I don't know," Nicholson told BBC Radio Devon. "There's no reason why that should happen other than maybe a mentality, maybe we got too relaxed." The loss brought Torquay's four-game unbeaten run to an end and they return to National League action on Tuesday when they visit Macclesfield. They were without four cup-tied players, including striker Nathan Blissett, for the match. "They're all available now (for Tuesday) and they'll probably get their places back because they did well in their last game and nobody's really staked a claim," added Nicholson. "It was bobbly, it was windy - who cares? There's no excuse, it's not good enough. "It's a poor performance, it's a poor day for us as a club - but let's not get too carried away, we now have to achieve our main aim, which is staying in the league."